Author(s): Nana Zheng, Ping Yang, Zhiwei Wang, Quansheng Zhou. Cyrus Tang Hematology Center, Jiangsu Institute of Hematology, The First Affiliated Hospital of Soochow University; Key Laboratory of Thrombosis and Hemostasis, Ministry of Health; Soochow University, Suzhou, Jiangsu 215123, China. MicroRNAs (miRNAs) control the expression of approximately 60% of protein-coding genes and regulate cell metabolism, proliferation, differentiation, and apoptosis. Notably, aberrant expression of miRNAs contributes to several diseases including cancer. Accumulating evidence indicates that miRNAs play important roles in EMT, genesis of cancer stem cells, cancer metabolism and carcinogenesis. Aberrant expression of miRNAs triggers tumor initiation, progression and poor prognosis of cancer patients. Accordingly, oncogenic miRNAs have emerged as diagnostic biomarkers and targets for novel anti-cancer drug discovery. However, the mechanisms of miRNAs contriving tumorigenesis are not completely understood. This review aims to clarify the identification of tumorspecific miRNAs, verification of oncogenic miRNA signatures, and dynamic study of oncogenic miRNAs in cancer initiation and development. Despite sound progress in miRNA-mediated anticancer therapy, several barriers like drug stability, immunogenicity, off-target effects and toxicities still remain. We hope our review could stimulate the further study of miRNAs in cancer research field, which may lead to new insights into the mechanisms of carcinogenesis and create new avenues for targeted cancer therapy. Keywords: Cancer stem cells, cancer therapy, tumorigenesis, EMT, MicroRNA. Affiliation:Cyrus Tang Hematology Center, Jiangsu Institute of Hematology, The First Affiliated Hospital of Soochow University; Key Laboratory of Thrombosis and Hemostasis, Ministry of Health; Soochow University, Suzhou, Jiangsu 215123, China. Keywords:Cancer stem cells, cancer therapy, tumorigenesis, EMT, MicroRNA. Abstract:MicroRNAs (miRNAs) control the expression of approximately 60% of protein-coding genes and regulate cell metabolism, proliferation, differentiation, and apoptosis. Notably, aberrant expression of miRNAs contributes to several diseases including cancer. Accumulating evidence indicates that miRNAs play important roles in EMT, genesis of cancer stem cells, cancer metabolism and carcinogenesis. 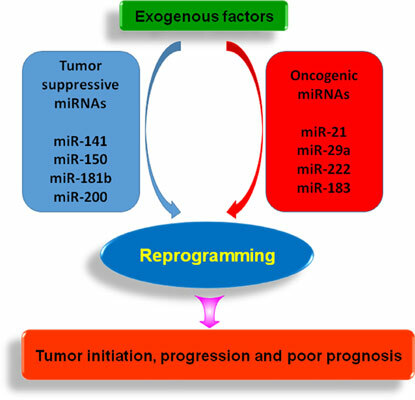 Aberrant expression of miRNAs triggers tumor initiation, progression and poor prognosis of cancer patients. Accordingly, oncogenic miRNAs have emerged as diagnostic biomarkers and targets for novel anti-cancer drug discovery. However, the mechanisms of miRNAs contriving tumorigenesis are not completely understood. This review aims to clarify the identification of tumorspecific miRNAs, verification of oncogenic miRNA signatures, and dynamic study of oncogenic miRNAs in cancer initiation and development. Despite sound progress in miRNA-mediated anticancer therapy, several barriers like drug stability, immunogenicity, off-target effects and toxicities still remain. We hope our review could stimulate the further study of miRNAs in cancer research field, which may lead to new insights into the mechanisms of carcinogenesis and create new avenues for targeted cancer therapy.